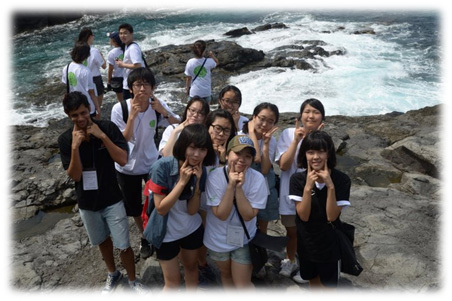 In the second week of August 2011, I had the privilege to join a 3-day wondrous trip with VANK office colleagues and members – Dokdo camp – an experience to remember. 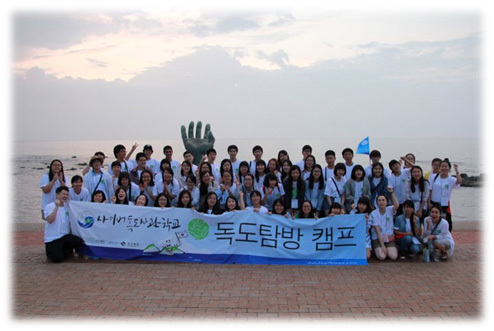 Dokdo camp is an annual visit to Dokdo island, organized by VANK for 70 selected students from across Korea. The aim of the trip is to provide students with information about the historical background of Dokdo conflict, and why Japan wants to claim ownership of this Korean island. We departed from Seoul on the night of 8th August. It was a Monday, a bit rainy, but very cool and comfortable for a day in the midst of heated summer. I guess that was a good signal for the start of a fascinating journey. I started meeting a lot of new friends here. 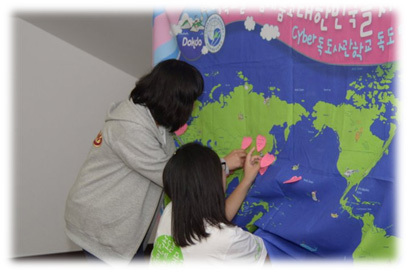 The members of the camp are bright students, who study at different schools, come from different parts of Korea, are of different ages, but they share the same passion: to learn more about and to protect Dokdo island. What impressed me is that, for their young age (the youngest ones were 14), they are very mature, considerate towards others, and many have a good command of English. As a “chingu” (friend) of many members, I feel they are amiable and friendly to foreigners. Some little ones tried their best to show interest in communicating with me even though they were nervous about their English. Through interacting with members, I could see that their adorable shyness cannot overshadow their kindness and enthusiasm. We stayed at Ulleungdo island, 120 km east of the Korean Peninsula and 82 km away from Dokdo. Elleungdo is an enchanting island that has become a favorite for tourists who love beautiful natural scenery with sea, forests, and mountains, especially tourists who love hiking. I felt thrilled and fortunate that I had been there to enjoy the serene beauty of Ulleungdo – such a captivating different side of Korea compared with the busy urban areas. 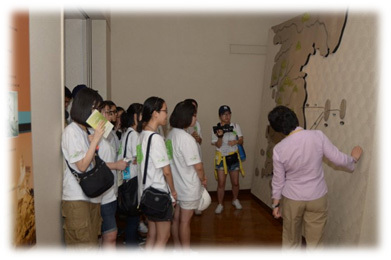 On the first day of the camp, we visited Dokdo museum – a place storing various historical documents (including old Japanese papers) confirming Korean rightful ownership of Dokdo. All members were delighted to gain more detailed knowledge about Dokdo and felt an even stronger urge to defend Dokdo from the claim of Japan. The evidence is so clear that Dokdo truly belongs to Korea that many students found even the idea of a dispute over ownership very difficult to grasp. This same day, we visited Dokdo Observatory by cable car, climbed up and down the mountain for some breathtaking view of the sea, then took some memorable group pictures capturing many members with messed up hair in the wildly blowing wind. I was glad we had this fun time as an opportunity for every camp participant to start getting closer to each other, for many of us were mere strangers the day before. We chatted about our feelings after seeing the museum, our fright of slipping down the steep cliff as we hiked. Then naturally we our conversations started to cover more topics about ourselves as members got to learn more about one another. 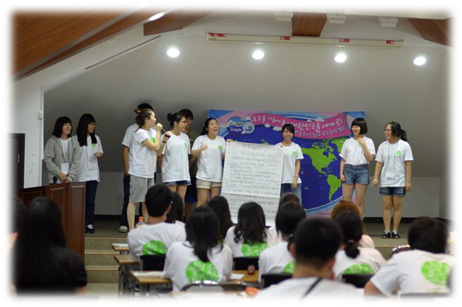 In the evening, we all gathered in separate teams preparing for a presentation in Korean. Even though I spoke no Korean at all, my team members were too nice to leave me out from the Korean presentation. So they taught me to memorize a few simple words to shout out at the beginning. I felt blessed to be in my team. The next day, we received news about unfavorable weather and unusually high waves that prevented us from visiting Dokdo as planned. We were all disappointed about not being able to set foot on the beloved island we had heard so much about. Fortunately, the disappointment did not linger long since we promptly adopted an alternative plan: travelling around Ulleungdo. The whole morning was wonderful; buses took camp members from place to place, visiting several popular scene spots in Ulleungdo where we immersed ourselves in nature: sunshine, wind, sea, rocks, and the trees. It all felt like a healthy exercise, hiking in the mountains and along the coastal lines, and breathing in ample fresh air. In the afternoon, each team was assigned to create a performance. My amible Korean teammates gave me a pleasant surprise again when they decided to write a storyline involving Kpop and Super Junior – my favorite Kpop group! That evening, before our little show, as I talked more with my acting partners, I grew to love my team members more. After the performance, everyone was very sweet and complimented me, and again I felt grateful that I was part of this genial team. Our following activity was to write a letter explaining our feelings and thoughts about Dokdo controversy. I wrote about my worries as to the effects of conflicts like this on the peaceful diplomatic relations between different countries; this has been my concern for a long while. I was confused at first about what to write, but in the end I am glad to have finished such an activity. I think the writing exercise was very helpful to all students, because we had digested a lot of information during two days, and the writing allowed us to reflect deeply about what we had learnt, and to get out our feelings onto paper in an organized manner. The atmosphere was special too. It felt weird to write about Dokdo on the land of Ulleungdo. At that time, Dokdo was so close yet still so far away from all of us, for we could not go there. Visualizing Dokdo in our minds, we wrote about the island, with our love, longing, and concerns for this Korean land. Then came our final day of the camp, time flied strangely quickly for me on this island. We wrote on paper, and then on little heart-shaped notes, our dreams for our countries. We stuck our notes on a board, creating a beautiful board full of dreams and wishes of the young generations for a better future. I think I speak for many other members when I say that this was a very meaningful activity to students. Putting my dreams into words motivates me to work harder to contribute my small efforts to bettering my country, helping it achieve those dreams. I am fond of every moment of the camp and every camp member – not only those I was lucky enough to have had a long chat with, but everyone. Given the camp’s large scale, it is reasonable some members were unable to seek a chance to talk to someone else. Yet I think, sometimes maybe all it takes for us to become friends is to walk by each other and give friendly eye-contact, or flash a smile, or work together for a common goal. Words and talks are not compulsory. Also, though we did not get to set foot on Dokdo island, we all still learnt a lot from Dokdo camp. We learnt to love, to protect nature and the land of Korea thanks to the outdoor activities; we learnt to love each other more and to build stronger bonds teamwork; we learnt from others and we learnt about ourselves. We gained new friends who, if we are lucky, would be there by our side for a life-time. I am happy I was part of this amazing journey – an experience never to forget. I am happy to be a friend of Korea.